My goal with this article is to convince you that there is a right and a wrong way to fundraise on Facebook. Will you believe me? Probably not, but let’s try anyway. You probably use Facebook every day like everybody else. Therefore, it’s a no-brainer to use it in your next campaign, right? This article is to share with you what I’ve learned about how to actually raise money using Facebook. I do want to warn you. I’m not writing as an authoritative expert on this subject. I’m writing based on what’s worked for me, and what’s worked for the Catholic causes that I’ve helped. I’m still learning how to use this massive social media platform because it is so influential. 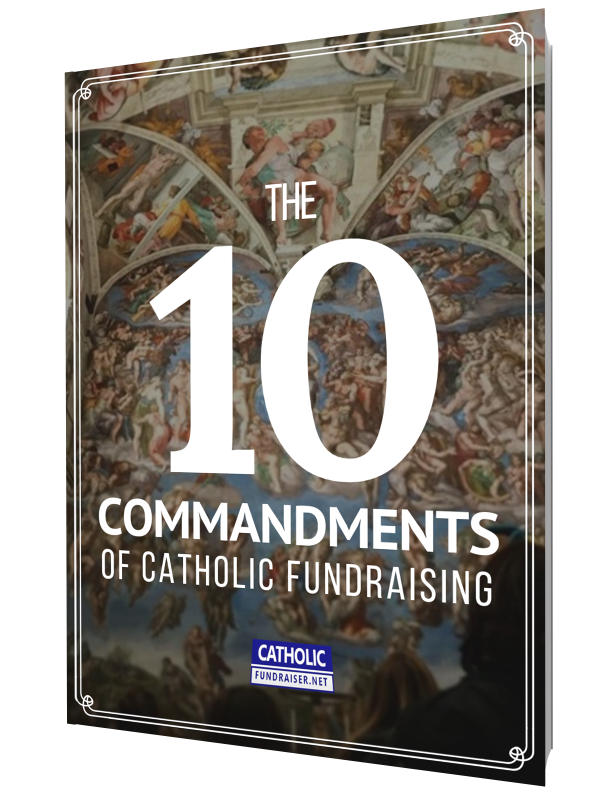 With so many Catholics using it every day, you’ve got to consider it a part of your fundraising. Two weeks ago, I wrote an article on why most Catholic websites should not have a donate button, especially on their homepage. You can read that article by clicking here. I received several comments about the validity of my viewpoint. Yes, my approach is not mainstream. In fact, it is contrarian. But why be mainstream if it is not working? It’s a fact that most people who visit your website are either new visitors or looking to connect with you. When arriving at your homepage, people want to know what you do, where you are, and how they can interact with you. Any request for a donation is usually overlooked. This is what I call hope fundraising. Sure, if what you are looking for is anything you can get, go right ahead. Keep the button and see what happens. In my experience, people donate after they have a relationship with you. They don’t give because you asked or had a donate button. Therefore, my approach always focuses on engaging with people and building their trust. Okay, let’s do a simple test to find which approach actually works better. Let’s estimate that you meet 1,000 people, or you have 1,000 people visit your website. With the donate approach, you immediately ask for a donation, and with my approach, you only ask them to stay connected. The table below outlines what happens based on industry standards. The approach which asks people to donate via a button raises $750. My approach, which asks people to first stay in touch, raises $3,750. I recommend you watch my YouTube video which goes into more detail about these figures. You raise 500% more with my approach! This is a massive difference, especially if even more people visit your website. The major factor is the initial response rate. When you ask people to donate before building a relationship, the response rate is only 1%. However, if you wait and focus on connecting first, the rate jumps to 15%. When you include the increase in donation amounts, $50 to $100, your fundraising moves forward much quicker. Great charities understand this. They focus on how to get as many people engaged in their work. They do this by serving them first, not by asking them for money. In a previous article (7 Ways to Give to Others), I walk you through the seven ways you can serve the people. Then, inspired by what you do, many will financially support you. How then should you ask for online donations if a prominent donate button isn’t the option? 1. Have a donate page rather than a donate button. 2. Rather than inviting strangers (website visitors) to donate, only ask people you know. 3. Find the most personal approach to directing them to the donate page. For those who do not donate, thank them for considering your request, and ask them to consider a donation the next time you ask. It’s important to remember that God places people in your life for a reason. If you follow hope fundraising, whereby you place a donate button and hope somebody clicks it, then you may get something. But will that support your dreams, passion, mission, and cause? Is that going to help you help those around you? Will this approach move forward with what God is asking you to do? One of the great qualities of the Catholic Church is that we recognize the uniqueness of everyone’s path, and we take the time to use this as a starting point. That’s why the sacramental life is so profound. We have seven unique sacraments for seven unique moments of life. Let’s remember the uniqueness of each person and replicate this in our fundraising. Instead of just hoping people will donate, let’s reach out and look for ways to connect with them. Why should your website not have a donate button? I maintain the parish website (Our Lady of St John Wood) of a priest who is a good friend of mine. Fr Jeff recognized that more and more people discover his church, his choir, and liturgical celebrations through the parish website, YouTube channel, and social profiles. In the past two years, his Sunday Mass attendance increases month after month. The numbers at his feast and solemnity celebrations also continue to rise, as well as the number of people who attend events throughout the week. To keep the momentum, Fr Jeff is improving his website because he wants to attract even more Catholics and visitors to his church. It’s a fact that more people check their email and the internet than they do the mail, newspaper, or television. To sum it up, the internet is where it’s all happening. Pope Benedict called it the digital continent, and you have to be both present and visible. The majority of people in your area surf the web each day, and many of the searches are for religious activities in their area. Catholics search for a Sunday Mass to attend during their vacations. Lapsed Catholics browse for events that might be interesting in their area. Or maybe they are looking for someone to speak to during a difficult moment. In most cases, they are looking to connect with you in person. Therefore, your website should direct them to take actions that lead to person to person engagement. This means switching the donate button (which likely takes the most prominent spot on your site and yet is never clicked) for something the visitor actually wants to click and act upon. Your Catholic website should provide the information that directly matches what people are searching for when browsing the web. This includes parishes, abbeys, cathedrals, charities, schools, universities, retreat center, mission, or any other Catholic cause. It’s no longer enough just to have a website. You have to provide the information that matches what people search. Fortunately, it’s not a mystery what people want to find. Below I list the four essential pieces of information you should have immediately visible and accessible. The four essential pieces of information your Catholic website should make visible and easy to access. Mass times are the number one piece of information that people search for on the internet. Therefore, put this information front and center on your website. If you are a charity, make sure that you clearly display your upcoming events. Allow your parishioners to review your sermon by uploading it as a blog post. Your collection of sermons then makes an excellent reference library for people to learn what the Catholic Church teaches in a format that’s easy to read. If you don’t have sermons, post a weekly blog which explains a topic people are interested in reading. The majority of people who search for Catholic related topics are looking for support and community. Rather than asking for a donation, I recommend you take the more Catholic approach and reach out your hand by replacing the donate button with a prayer or Mass intention button. Remember, people will donate to you when they know who you are and trust you. They don’t give because you asked. I go into further detail about this topic in another article, 5 simple ways to increase Catholic donations through your website. Make clear where you are by including your city, country, and address. Too often when searching for a parish in London England, I find a parish in London, Canada, but it’s not clear where the church is because the contact details just mention London. Provide a Google map window so people can verify your location, and include the name of your priest, parish secretary, contact phone numbers, and emails. This approach is better than offering a person to complete form because people want to connect with a person, not fill in a form as if they are in a doctor’s waiting room. I provide further details on how to design a great Catholic website in the article, How to have 1,000,000 people visit your Catholic website and donate. I also outline the different tools and services you can use to make your Catholic website look incredible in this article, How to create an amazing Catholic website. When you take this approach with your website, you will find more people engaging with you on your website and in person. This is where the magic happens. When people engage with you more, they are more likely to donate. So focus on giving them what they want first, rather than what you want.